One of the best things about owning a pug is not necessarily knowing about the common ear problems in pugs but being prepared to make sure your little buddy is comfortable and taken care of is important. They live longer than other breeds so you get some bonus years of love and joy as well as some extra time to give them a great life. One of the least good things about owning a pug? They too have the same kind of health issues as other breeds; they aren’t immune to diseases and can come down with sickness just like you. Having gotten the facts right, this blog explores in detail one of the most persistent health issue these four legged kids suffer: ear problems! Your pug’s fold-over ears make an ideal spot to hide dirt and grime and can easily breed an ear infection or allow for ear mites. You should never limit your dog’s health and maintenance to the regular visits to the vet. It’s equally imperative that you are pay attention to it between these checkups so your pug’s ears remain healthy. Or that if you are able to pick up on any sign or symptom indicating a problem, you will be able to take them on time for professional help even if it means an extra visit to the vet. It will take only a few minutes more when you groom your dog, but cleaning the ear with specialized wipes is important and it helps you avoid some truly preventable health issues, which when fully developed and untreated can not only be painful but also permanently damage its sense of hearing. It’s suggested that you use both your eyes and your nose (yes, you read it right) when performing an ear care inspection. Use a pet scope if you are unable to see inside your dog’s ears and check for significant wax buildup, redness, or other foreign matter. Sniffing helps in detecting some problems early on too; it’s not normal for it to produce a foul odor unless of course an infection is accompanying it. And to complete it, do feel the pug’s ears too; they should be warm to touch. When examining your pug, it’s okay to gently pull the ear all the way back so that you can see everything that is going on. Do not force the dog into this, rather, ensure that your pug is comfortable with you handling and inspecting this sensitive area. Also, do be sure not to yell or speak loudly and directly into their ear so as to prevent any hearing damage. Also known as Otitis Externa, the problem can occur in one or both of its ears. The ear canal will turn red from the healthy, slightly pink color and appear to be swollen and there might even be bleeding with or without a pus-like discharge. Antibiotics prescribed will keep it from spreading and reduce the pain for your pug even but it’s very difficult to cure; sometimes, surgery to open the car canal is the only option left. 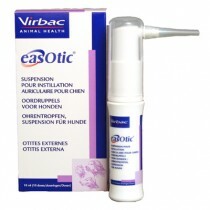 One things that has worked especially well for Dixie is the ear solution provided by her Vet, Easotic. One of the tasks of routine dog ear care is to remove the hair inside the ear to help it steer clear of chronic ear problems. Besides, if you are doing it on a routine basis, plucking a few hairs a time, then you will make the procedure less irritating for the dog too. Plucking the hair growth is not difficult but if you are unsure about it, ask a professional groomer or your vet to show you how to pluck them. Been hanging around a dog park, doggie daycare, or any other dog deep area? 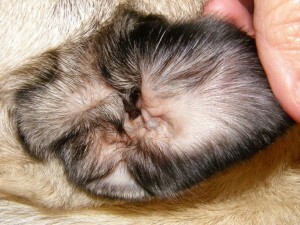 Another one of the common ear problems in pugs is the risk of coming down with ear mites is much higher in these environments. It does not mean your dog is unclean; ear mites are just very contagious, caught on when your dog’s socializing or rubbed another dog walking past it. Problem is they predominantly live in your dog’s ears, as per their namesake. A strong odor, discoloration of the ear canal’s entrance, itching, formation of crusty substance inside, and discharge are all signs of ear mites. You need insecticidal medication prescribed by the vet to treat it. 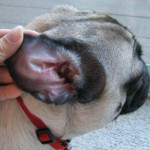 Below is an image of what your pug’s ear should look like. If you see an abundance of ear wax in there or sense that something is a little off, be sure to clean it thoroughly with a suited cleaning product and monitor regularly. If things continue to seem off and your dog is scratching often or seems uncomfortable, be sure to call in an appointment with your vet and take care of business.